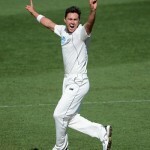 The Black Caps amassed 443 runs in their first innings and declared the second at 241 after losing six wickets. England was bowled out cheaply for 204 runs in the first innings but came back strongly in the second and managed 315 runs with one wicket still in hand at the end of the match. The third and final Test of the series concluded on Tuesday, March 26, 2013, at Eden Park, Auckland. Earlier, England started the day at a dismal position since they lost four wickets after scoring just 90 runs in 52.1 overs at stumps on day four. Joe Root joined in with Ian Bell who was unbeaten for eight runs and continued the second innings with determination while avoiding any unnecessary risks. Quite a few overs ended up in a draw and the batsmen kept on creeping with occasional boundaries. The skipper of New Zealand, Brendon McCullum, made a few changes to get an early wicket but the pair remained consistent. The 150 of the innings appeared on board in the 80th over after a couple of fours from Bell. The new ball was taken in the following over and Trent Boult got the important breakthrough on the very first ball when Joe Root was declared leg before wicket for 29 runs. Ian Bell was dropped at 40 by Dean Brownlie in the fourth slip on the first ball of the 83rd over and the newcomer, Jonny Bairstow, was also dropped by Kane Williamson on the very neat ball off Trent Boult. Jonny Bairstow was gone at just six runs after the addition of nine runs to the total and the visitors looked like being in danger at 6-159 in 85.5 overs. 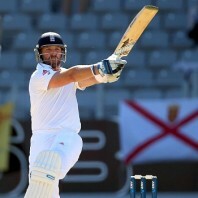 Matt Prior got together with Bell and they hit 3 fours in the next two overs as Ian Bell dispatched his 35th Test fifty. Matt Prior survived a review taken by the home side in the 92nd over, he was given out at 16 by the field umpire Tucker but the batsman took a review instantly and survived again. England went past the 200 runs mark in the 99th over as the duo kept on cruising nicely with regular boundaries. The seventh wicket shared a valuable partnership of 78 runs and lifted the score to 237 when Ian Bell was caught by Tim Southee at third slip off Neil Wagner for 75 off 271 balls with 9 fours. Matt Prior took over as a senior partner once Stuart Broad associated with him next and the first reached his fifty in the 112th over. Prior added another 2 boundaries in the next over and kept on playing a brave knock as Broad defended well at his end and opened his account with two runs on the 62nd ball he faced. 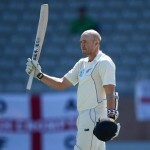 Matt Prior thrashed his brilliant seventh Test century with a four on the fifth delivery of the 134th over with a four and the third hundred of the innings was displayed on board in the 138th over. Kane Williamson removed Stuart Broad and James Anderson in the 140th over as the last pair survived for the rest of the five overs. Prior demonstrated a heroic knock and remained unbeaten for 110 off 182 balls with 20 fours whereas Monty Panesar secured his end by scoring 2 runs off 5 as England reached 315 for the loss of 9 wickets. Kane Williamson was the highest wicket taker with four, Tim Southee and Neil Wagner shared two each whereas Trent Boult claimed one wicket. The third and final Test ended in a draw and the three match series also came to an end without any result.